T-SQL Tuesday is a blog party started by Adam Machanic (b/t) just over five years ago. The first Tuesday of each month a blogger hosts the party and suggests a topic. Then anyone who is interested blogs on that topic. It can be a lot of fun and quite a challenge to blog on a topic you didn’t pick. Not to mention the time limit. I didn’t mention the time limit? Oh, well, you have one week to write your blog and then it has to be posted on the second Tuesday of the month. Your post must be published on Tuesday December 13, 2016. Don’t be late! Your post must contain the T-SQL Tuesday logo at the top (see above) and the image must link back to this blog post. 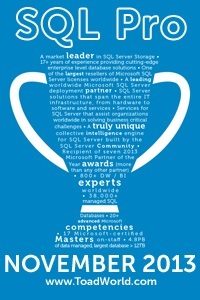 Otherwise, how will we know it’s a T-SQL Tuesday post? If you want to host just contact Adam and ask for a spot. I believe there is a requirement that you have to have participated in T-SQL Tuesday at least a few times, but hey that’s only reasonable right? « Using OUTPUT with a field list. T-SQL Tuesday logo is missing. Just in case you missed it. Added. *sigh* Lots of problems with this post. Sorry about that. I wrote a simple post about new snapshot management tools after finding the restore command I had in mind was resigned to the dumpster of history. Here’s link to my post about Maintenance Plans. Another one on the importance of actually trying to restore your backups, but this time introducing some new features in DBATools that make it much easier. T-SQL Tuesday #85: dbatools to the backup/restore rescue – highlights the current commands we have for backup and restore, such as Get-DbaBackupHistory and Get-DbaRestoreHistory – and even includes a video demo of one of my favorite commands, Test-DbaLastBackup. Sorry for the late entry, I haven’t been able to get trackback to work, so now I am posting this manually. The blog post came out Tuesday, as supposed. Only this entry is late.